I'm so excited to bring you today's post! My good friend Madelyn is amazing: there's no other way to put it. She has an eye for design and decorating that I admire so much, and boundless energy to get it all done. 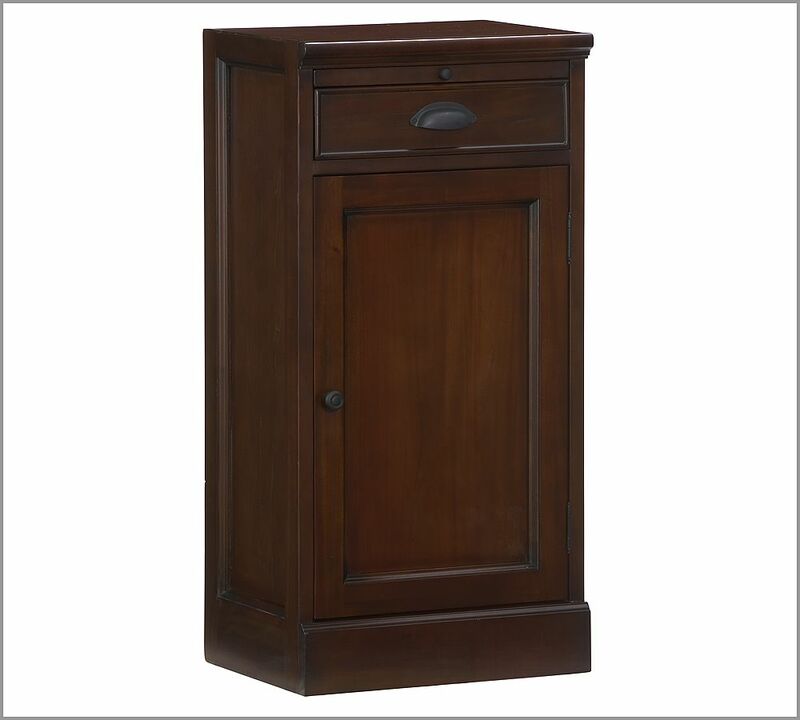 And she's always so unassuming about it: "oh, I just refinished a dresser and painted argyle on my walls this weekend, no biggie." [seriously: she painted argyle on her son's nursery walls - I think this may call for a guest post here at Swoon, no?]. 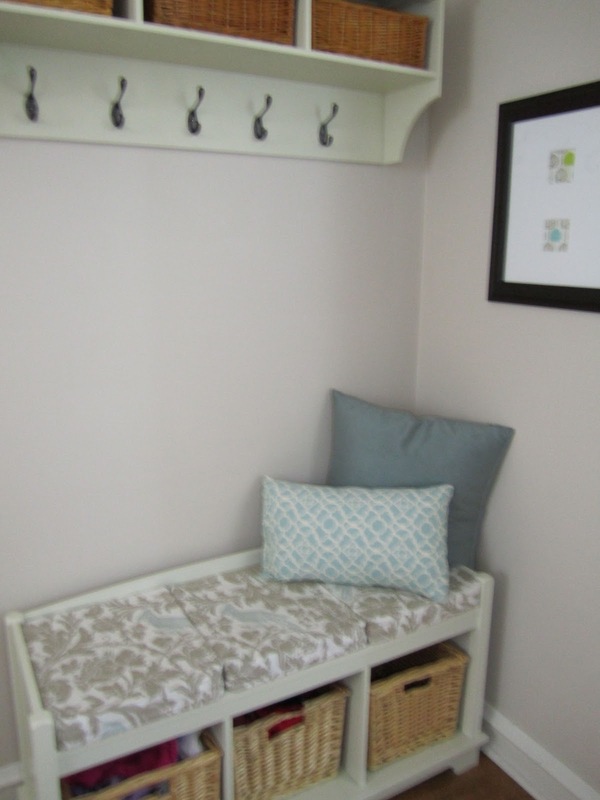 She has been redoing her guest room in a very feminine style and was on the hunt for a desk to suit the space. I'm so glad she shared her before & after with me! Before: she found this desk on Craigslist. She was able to see past the finish and the dated hardware and loved the potential, especially the graceful lines of the piece. And the price was almost too good to be true: about $40! 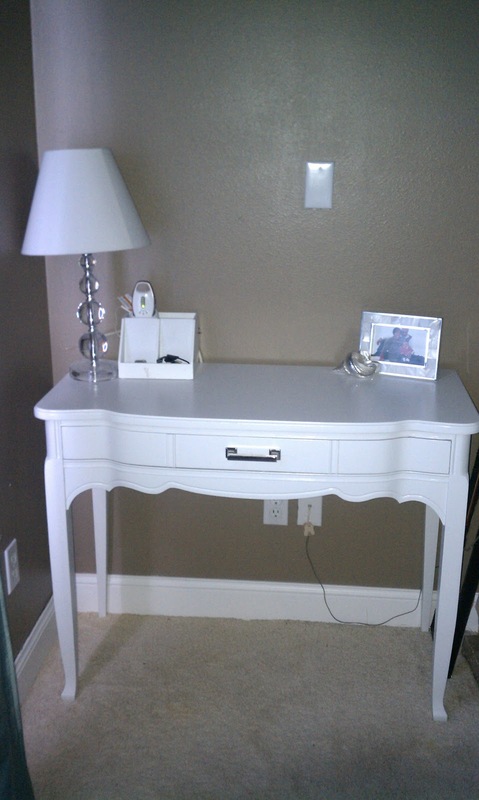 After: she used some white paint and bought some new hardware -- the desk became a totally chic stunner! Look at how lovely it is! Thanks to Madelyn for sharing her pictures, and here's hoping she sends more! Are you inspired to do a furniture make-over? I sure am! 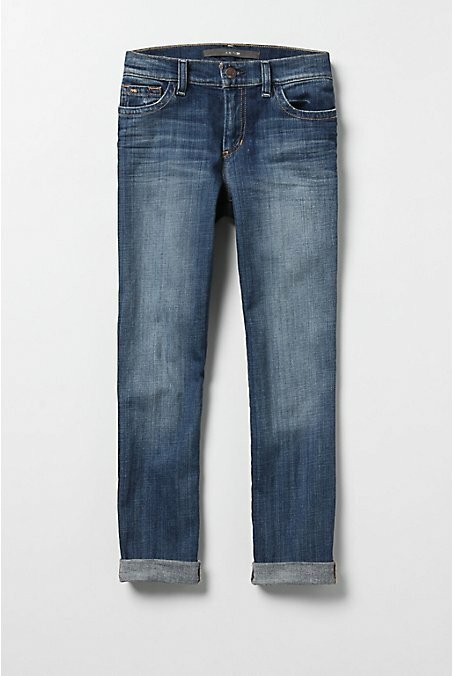 What Would Jamie Wear: It's time to spring your wardrobe into action! For all of you living in or visiting the northeast region of the country today, I hope you like wind and rain. I am so over winter and ready for sunny days and high temps. To get my mind off the thunder and wind storms that we have in store, I am going to focus on some new additions to my spring wardrobe. 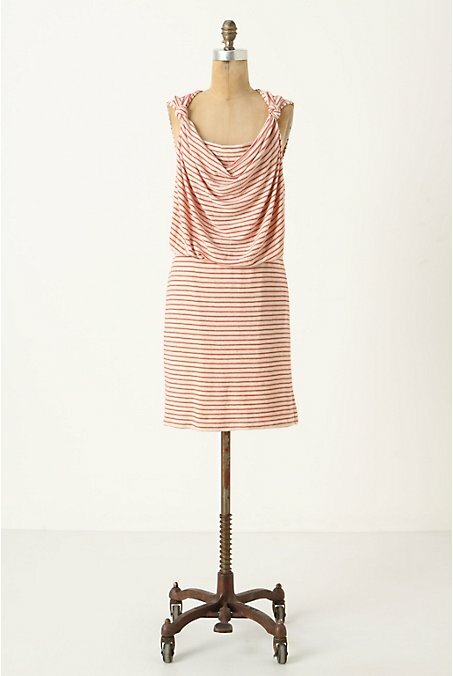 It is going to be an Anthropologie kind of day. 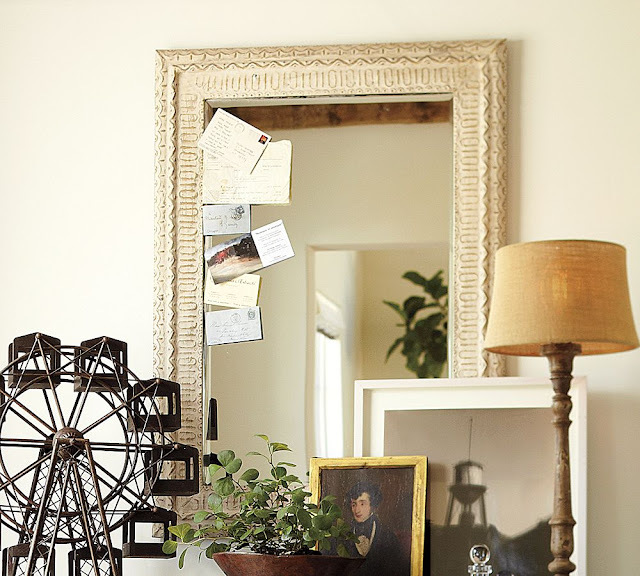 If you had not noticed by now, two of my favorite places on earth are Pottery Barn and Anthropologie. Wednesday I showed you my GIANT Pottery Barn shopping bag and now it is time to let you in on my spring wish list from Anthro. 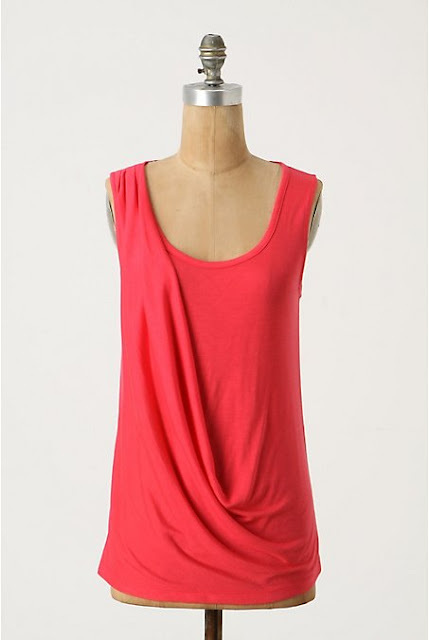 My birthday is in August and I am accepting early gifts :) Just kidding! I am not going to keep you waiting any longer so here we go! I am sure I will be adding more to my collection from all sorts of sites as new spring collections continue to pop up. 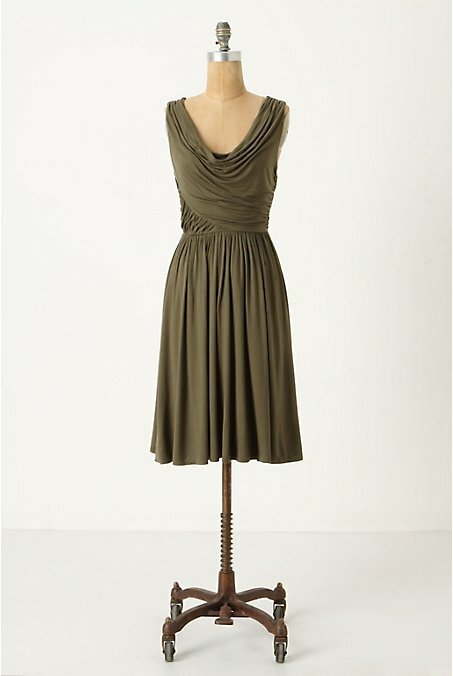 Have you started adding to this season's wardrobe? I have a laundry list of specific items I need to round out the outfits I currently own, what items are on your list? Whoa nelly. I didn't really anticipate organizing the garage in February. But I swore I'd keep to my challenge, and I did not want to let down the entire Internet. I ran out of closet space in my house, so I moved onto the garage. 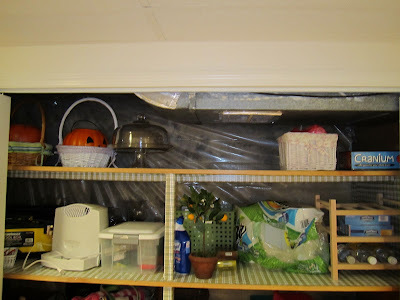 Now, granted, I am planning to paint the garage walls and floor in the Spring, so my organizational efforts are pretty temporary. 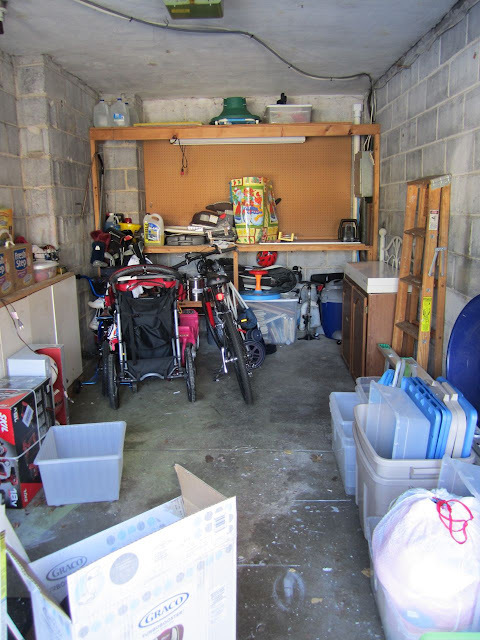 But, as you can see, the garage was getting a little insane. 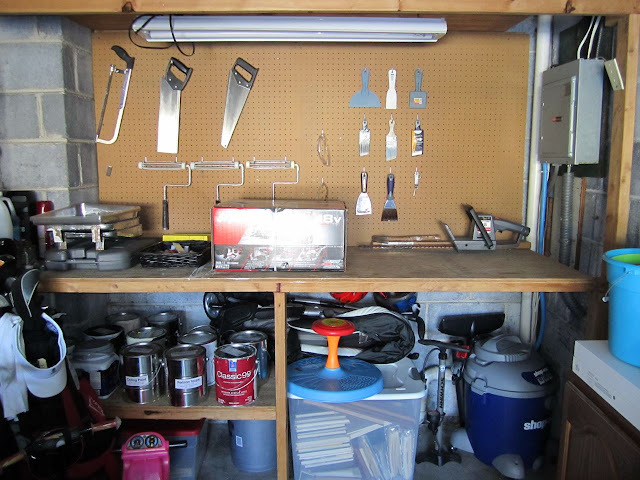 All it took was about 30 minutes and my garage became much more orderly. First step was to clear out the middle. 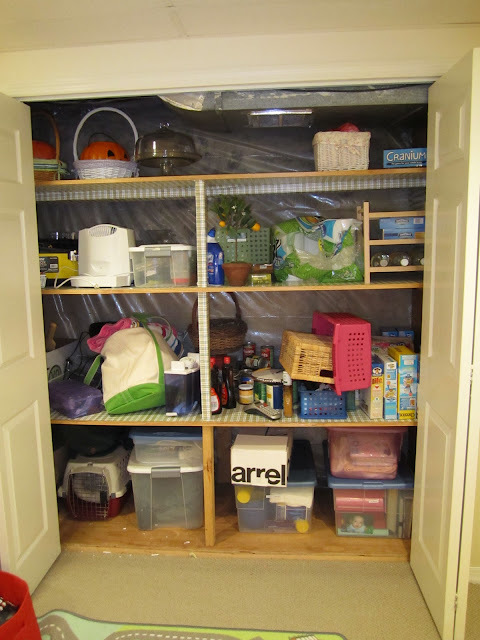 I pushed the cabinet I bought from the Habitat for Humanity ReStore against the far wall of the garage, which instantly made more space available. 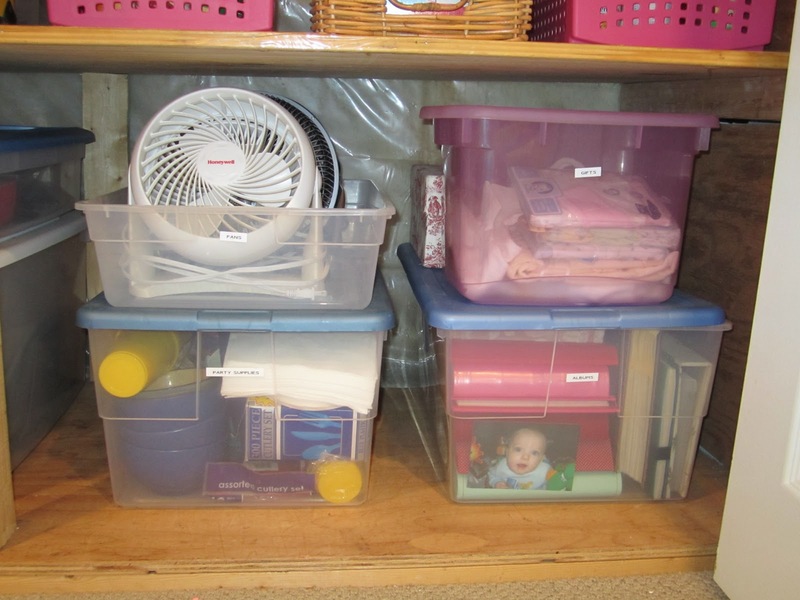 I have a *ton* of plastic storage bins, which I used to have in my craft room, but now have no home. I'm holding onto them for now: I am sure one day we will move and I will need them for a garage or storage closet. And I figure they can double as packing boxes when that time comes. 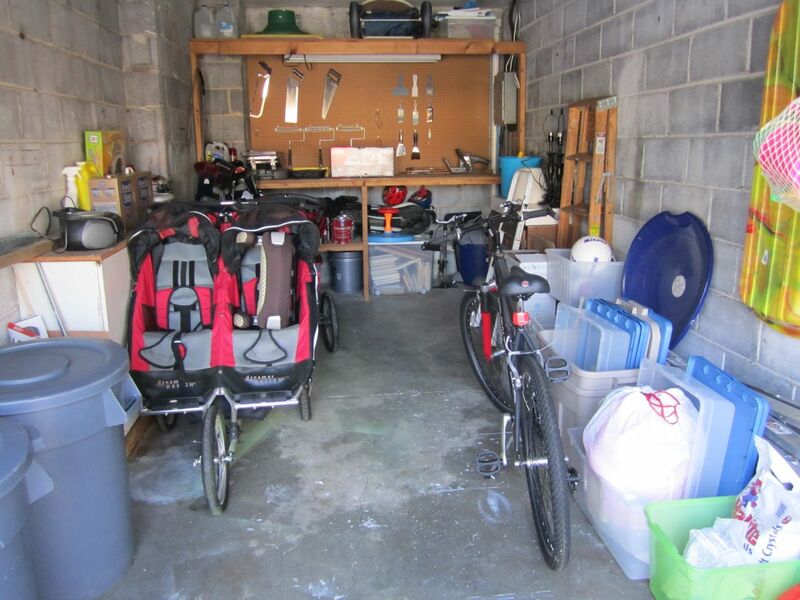 It's also kind of Stroller City in there, and I'll need to sell my double jogger eventually. But for now, it needs to stay. I tackled my workbench area and cleared it off. Then I used some peg board hooks left over from my craft room overhaul and hung my paint brushes, rollers, tools and saws up on the pegs. Nice! The last step was to sweep the floor and snap the lovely after picture! Not bad. Now when I open the garage, I don't cringe. Success. So, another month of organizational challenges is in the books! Next month is all about my friends and family ... I'm going to focus on my mother-in-law's dining room make-over and several reader submissions. Lots and lots of before and afters. I am so excited! Let me know if you have a before & after you'd like to submit! One of these days this room will come together. It works for now and the chairs we recently bought certainly help but my house lacks that homey feeling and warmth you get when you walk into a lived in house that is fully furnished with pictures, and curtains, and all sorts of fun accessories. I know we have only been in our home four months or so and part of the cold factor has to do with the fact that it is 26 degrees outside but I am getting seriously antsy. I am antsy for the warm weather and the kind of DANGER antsy that makes you go spend $2,000.00 at the drop of a hat on furniture and fun items for you home. Shanna and I have another PB outelt adventure planned for June, but until then I have been online creating a shopping bag of items that I would be proud to have grace my house. Of course I am going to share the bag with you! 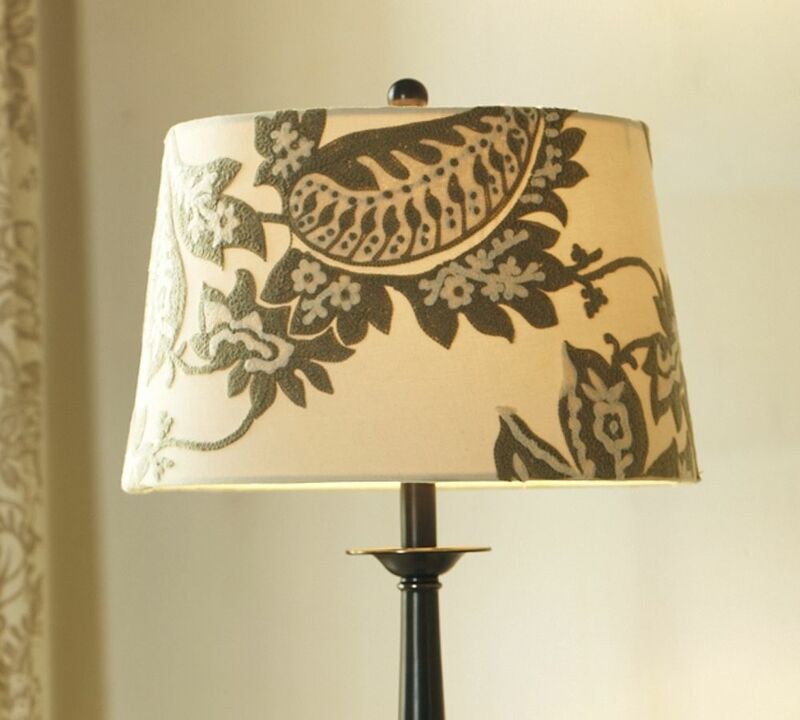 Do any of you out there decorate your rooms and then want to keep re-decorating because you love so many things? I would be happy to click my mouse and purchase everything I have in my online shopping bag, but who's to say I will not want to change everything in a couple months!? 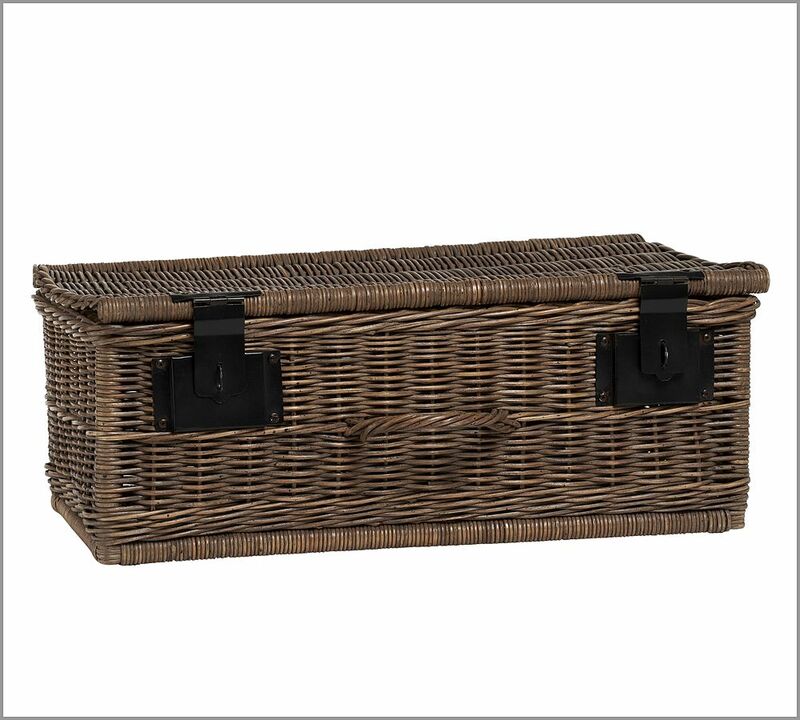 That could become very expensive so I am trying to be careful and purchase items that are fun but also classic so they will stand the test of time. And here is my shopping bag full of pieces I want to add to this room. 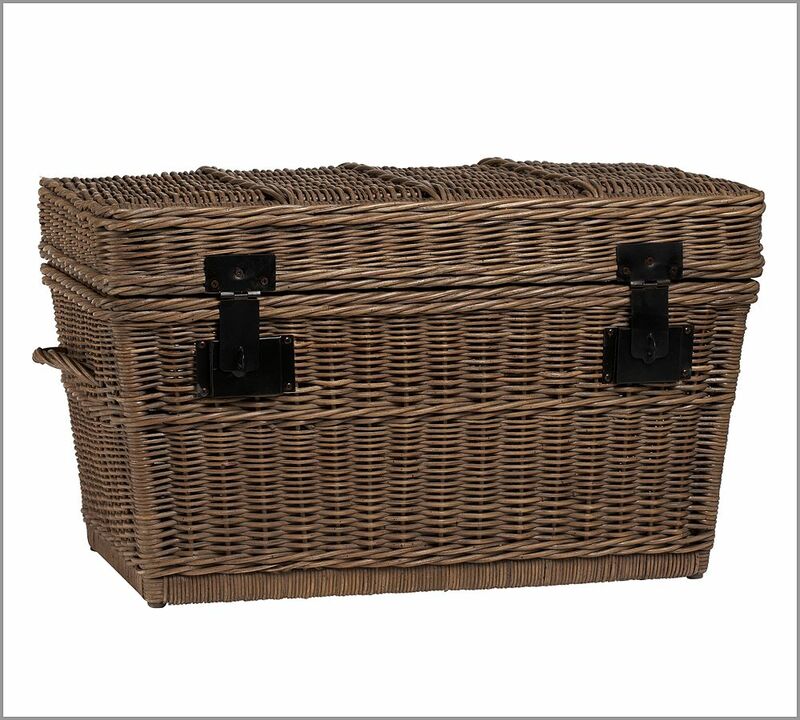 I plan to use this and the medium sized basket below between the two chairs. I am hoping to use it as a table and to help hide the radiator a bit. ﻿There you have it, now for some bold pillows to liven up the place. Off to shop some more, and when I find what I am looking for you will all be the first to know. 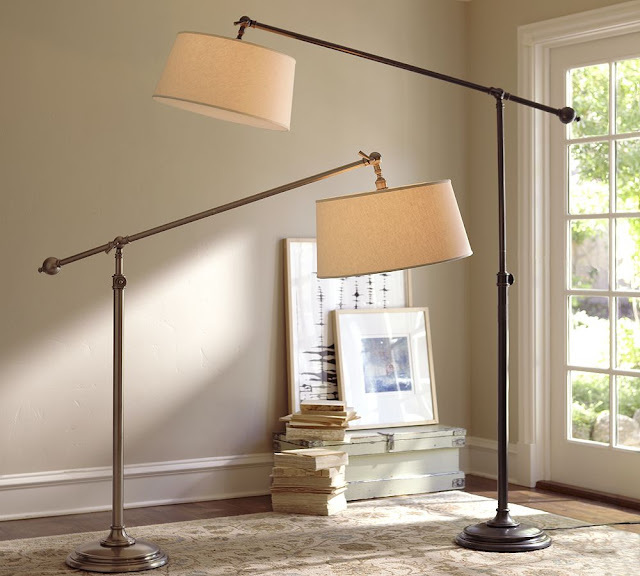 Are you searching for ideas to decorate your home? We would love to help so drop us a line! Over the weekend our neighbor and and a very good girlfriend of mine came over for a little wine and relaxation. We got to talking decor of course, and found a few really great items that I will be purchasing in the near future to add to to my home collection. After these major elements are in place I can start adding pictures and mirrors to the walls (maybe after a year and half I will actually order some wedding pictures to display!). 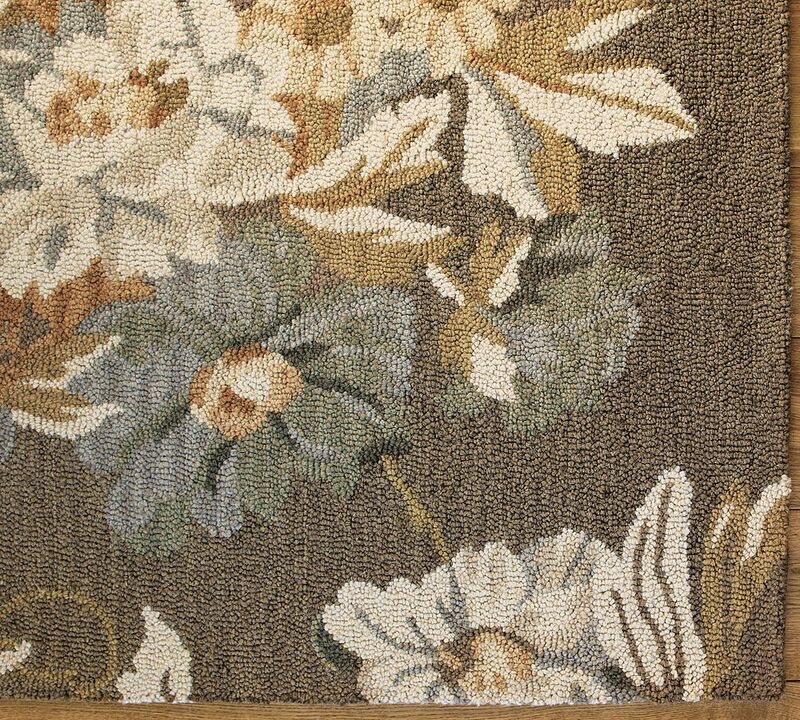 I have heard the best way to design a room is from the rug up and so far this has been the best plan of action for me. Stay tuned this week, I have more to come for the front sitting room! 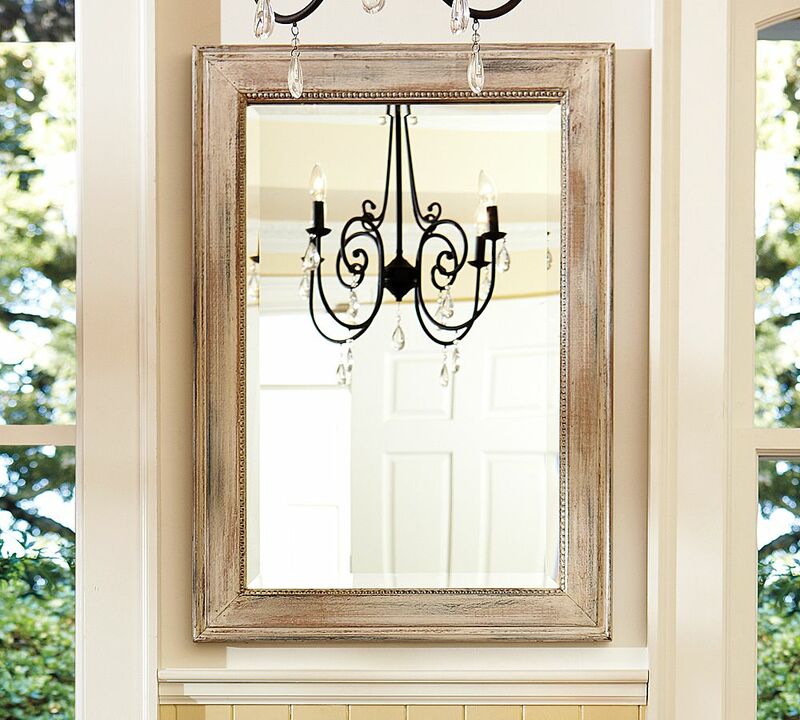 What rooms are you currently decorating or getting ready to tackle? 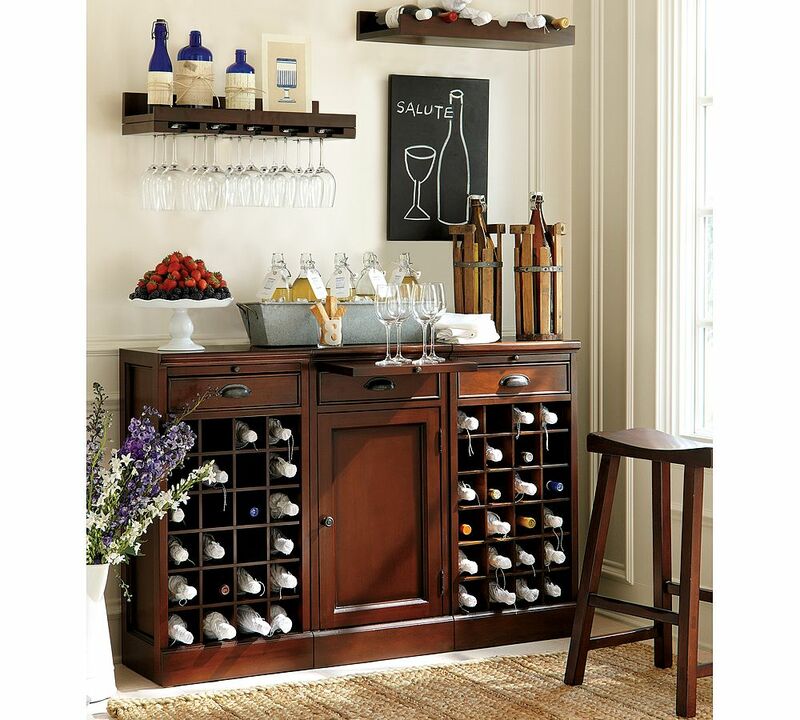 Any items you are dying to add to your home decor? I would love to hear about your plans﻿ and if you have taking pictures along the way send them over so we can show your amazing transformation! Let me give you some unsolicited advice: if you have children, especially young children who like Oreos and "cha-ba-bip" cookies, it may be wise to avoid silk fabrics in your living space. I'm not exactly sure what I was thinking when I got the brown and blue striped silk pillow from Target for my living room. Because in record time, my children destroyed it. Awesome. 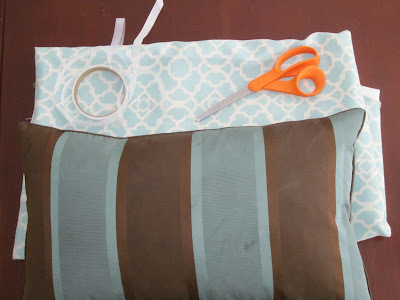 I have tons of fabric on hand and I am still afraid to use my new mini sewing machine, so I got out my trusty seam tape and decided to recover the pillow. Non-sewers unite. It was easy and it looks great. 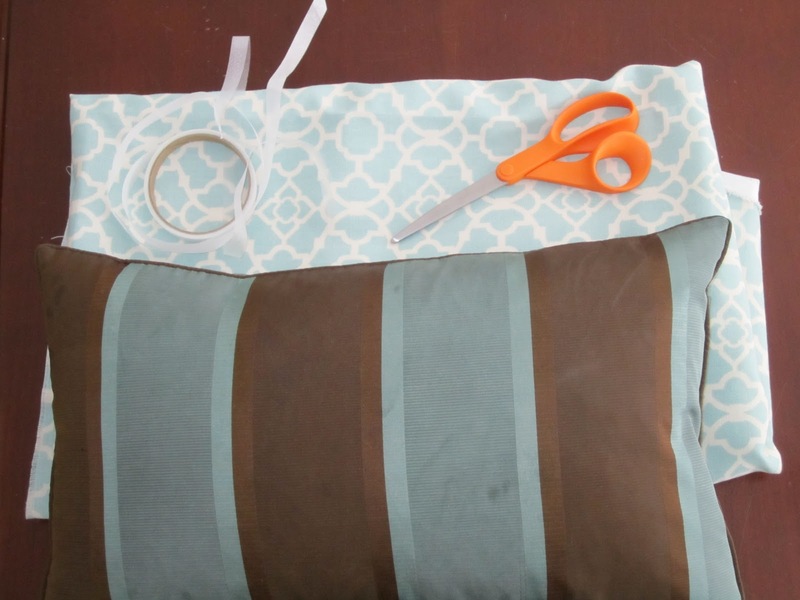 Here's the deal: you'll need permanent fusible seam tape, fabric, scissors and a template (the pillow cover formerly on the pillow) and an iron. First, take your pillow cover off. This will be your template. Place it on top of your fabric and cut around it - make about a half inch border of fabric around the old pillow cover (by the way, see the stains? I told you ...). Next, turn the fabric so that the back-sides are facing out and the print is on the inside. 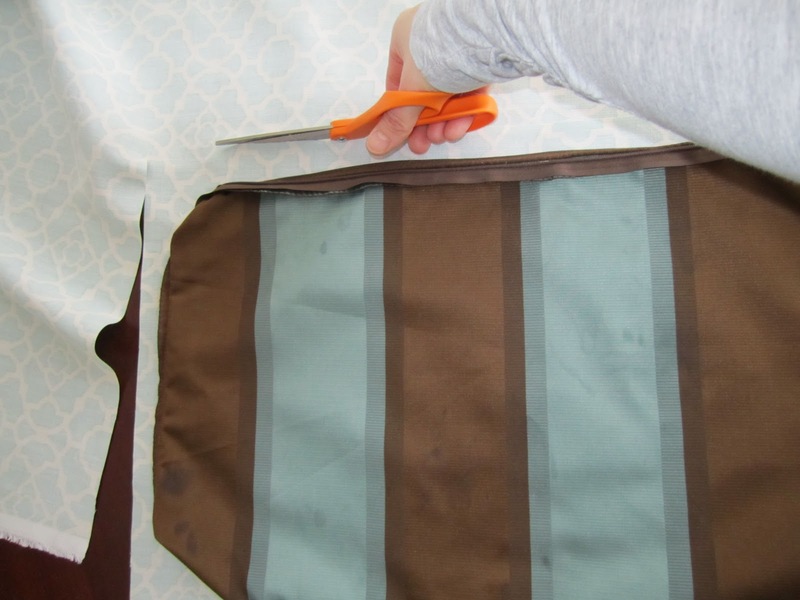 Place your fusible tape along the outside edge between the two layers and iron away. I usually hold it for about 5 seconds, then move down the edge to create a nice strong hold. Here is your hem! Doesn't it look good? Repeat on the other two sides. The last side is not easy: I won't lie. 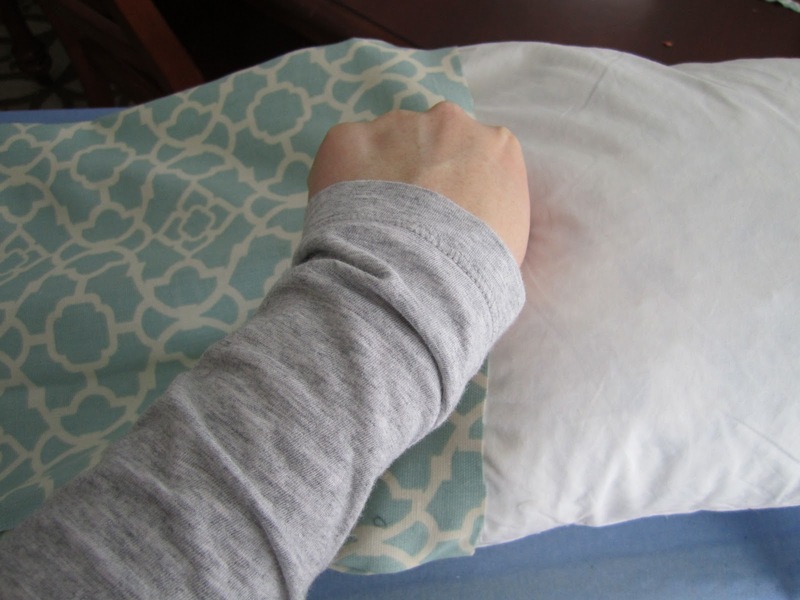 If you're doing the no-sew method, you'll have to stuff your pillow and iron the tape on with the pillow in the fabric. 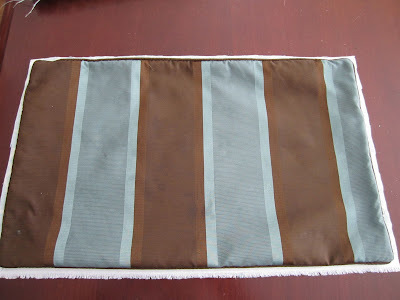 What I did was stuff in the pillow and then fold it over itself so I had a little room to iron the fabric. Next time, I will use pins to hold the fabric in place and remove them as I iron. My last seam got a little wonky, but I doubt anyone would notice it unless she was specifically looking for it. And here's the finished product! 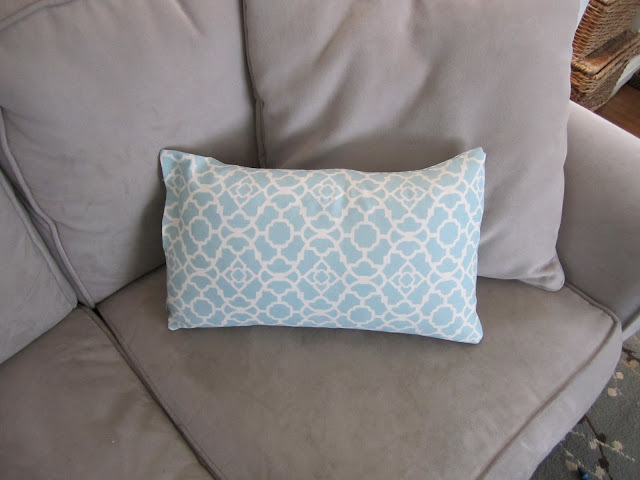 Here is my new cute pillow on my couch and on the entry bench. Look at how versatile it is! 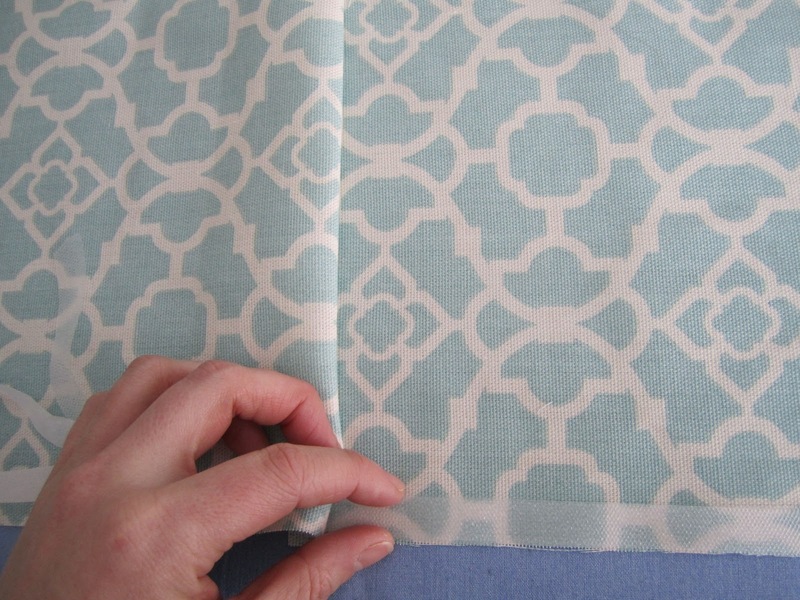 Is it abundantly clear how much I love the no-sew fusible hem tape? I'm going to get brave eventually and use my little sewing machine. But for now, the tape works. 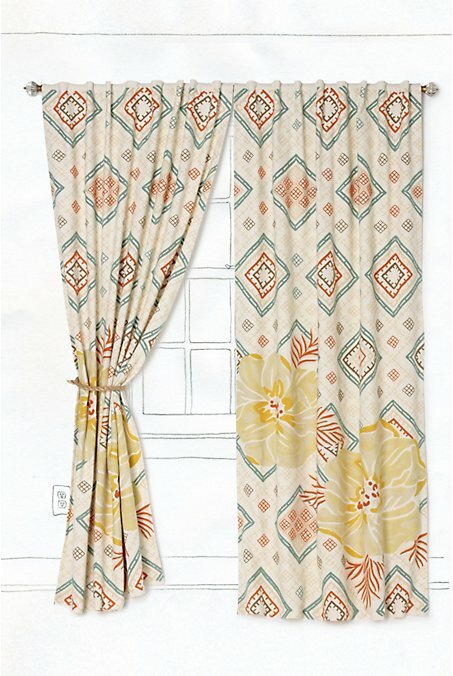 I even helped my good friend Heather make no-sew valences for her son's bedroom this past weekend. Stay tuned for pix and a tutorial very soon! 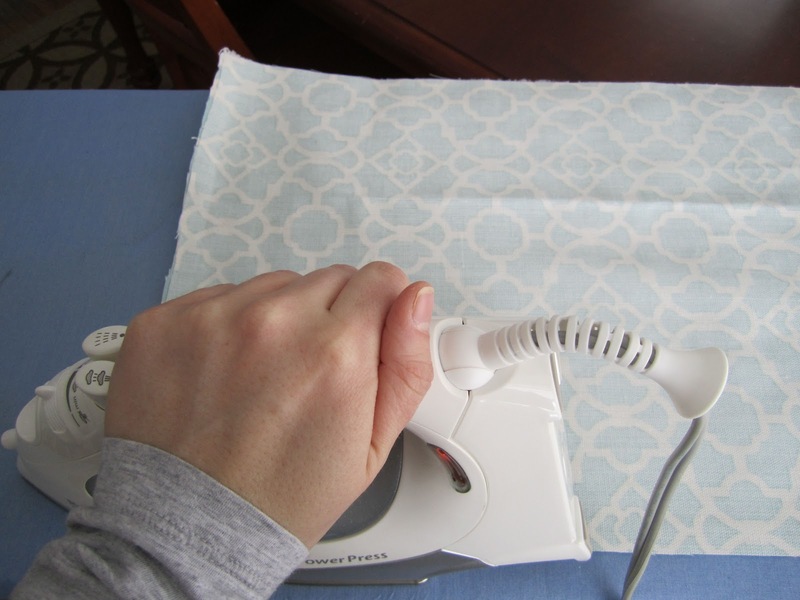 Have you used the no-sew method? Please share if you have! I love hearing about the magic of this product. Any of you out there looking for a good night's sleep? Search no further. I have officially had four nights of amazing sleep and am completely in love with my new bed. Kelly and I have had been sleeping on his mattress that we took from his parents when we first moved out about six years ago. After last weekend, I was done and willing to spend million dollars just to get a night of rest without tossing and turning. Off to Sleepy's we went! I had a set number in my head on what I wanted to spend and the second I laid on the mattress that was to be ours, I blew that budget out of the water. I do not recommend doing this but I was desperate for a good night of sleep so I can still say I do not regret going a bit over what I had anticipated spending. First, you go into Sleepy's and they greet you, this part I expected. The next course of action is laying on this twin size foamy bed thing that is hooked up to a computer. The computer analyzes all of your pressure points and they talk to you about any pain you are having. Once Kelly and I laid down, they gave us a print out showing that I needed a softer bed and Kelly needed something a little firmer. Just looking at this right now makes me jealous that my cat, Speedo, was laying in it when I left this morning. I have found myself wanting to go to bed around 8:30 just so I can lay in its lusciousness.﻿ I would show you what it looks like in my room but I have yet to actually make the bed so when I do that I will be sure to show you a picture. What I have not told you about this bed is that my half is exactly the softness I need and the other half is an exact fit for Kelly. When they deliver it, the tags you see at the bottom have your color from the computer so you know which side is yours. Even if you are not going to buy a mattress at least stop in the store and take a nap on this thing. Love. We also threw a couple of these guys in for good measure, it was almost like paying for a wedding. 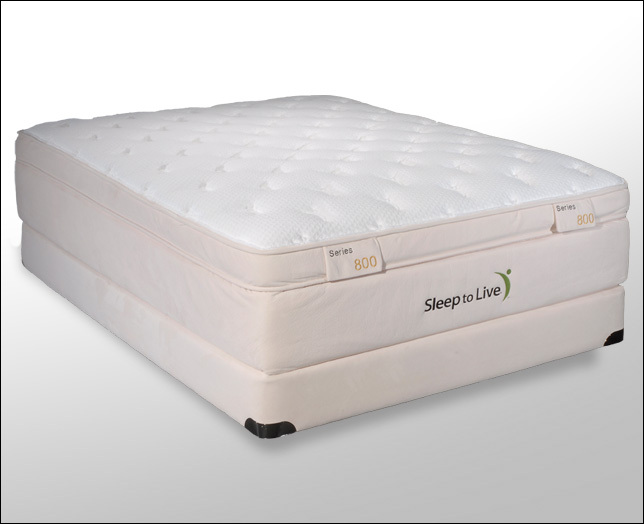 What's a little extra cash after you buy the mattress? DANGER, I know, and for those of you planning a wedding or have been married, you know what I mean about spending money. 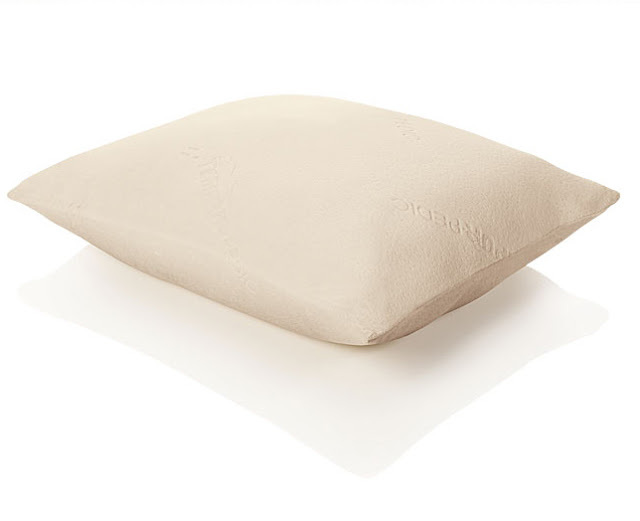 So needless to say, the Tempur-Pedic pillows came home with us too. 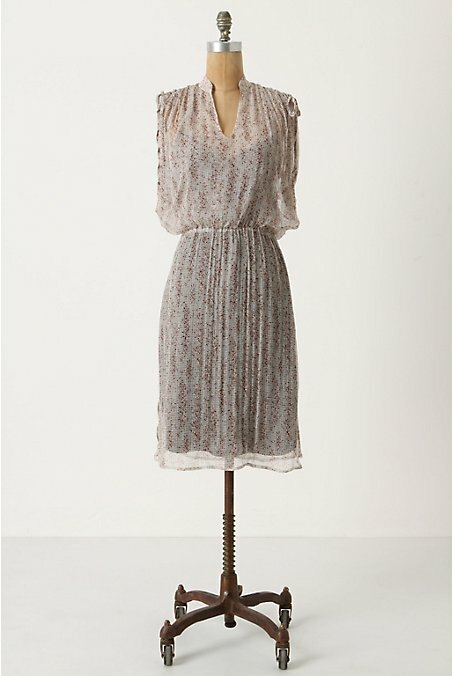 Do you have any swoon-worthy finds this week? Send them our way so we can share them with everyone! Mmm, it is still Winter. I am usually a big time Winter gal: I hate being hot, I hate humidity. I usually just love Winter and the cold, brisk air ... but this year, I am Officially Over Winter. The warmer temps last week and on tap for this week are encouraging, but I am ready for Spring right this instant. And last week, when I blogged about my friend Toya and her blog Life of a Ladybug, I mentioned one way that makes me think Spring is to indulge in new make-up. The Glossarie is another new favorite site of mine. I mean ... just take a look at her header. I want everything. I especially want those Guerlain Meteorites! Oh, and the NARS blush. OK, and the L'Occitane hand cream. OMG, is that a Bobbi Brown Shimmer Brick? Must stop. I recently discovered The Glossarie, when Lara (the author) left a comment on our blog. I tracked back to her site and totally swooned. Lara does reviews and write-ups on products that run the gamut from drugstore bargains to high-priced luxury brands. Gotta love that. I also love her effusive and warm writing style - each post makes you genuinely excited to try the product (oh ... if only I had an unlimited budget) and to come back and see what she'll feature the next day! 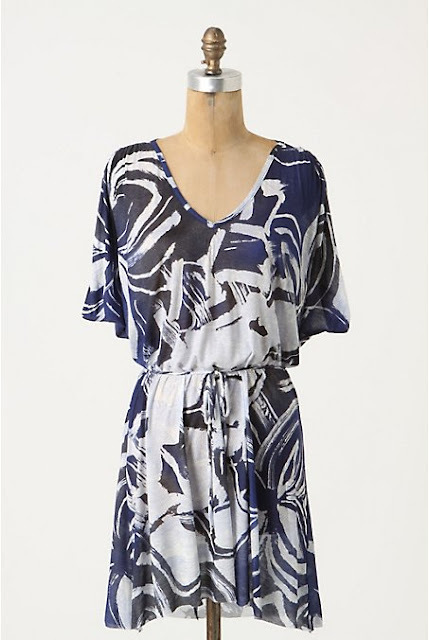 Click on over to The Glossarie and let us know if you like it as much as we do! 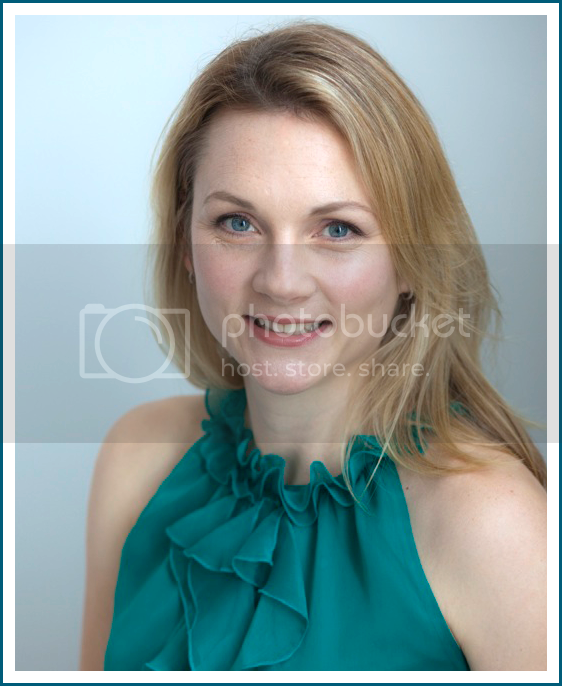 Here's a pic of the gorgeous author, Lara! I surely can't be the only one ready for Spring. If you are, let me know ... and while you're at it, share any fun, Springy make-up finds that you've scored! Last week I showed you my refinished dining room set that I bought on Craigslist. I had planned on showing you a tutorial on how I completed this project and last week one of our readers had asked about how I did the distressing so I will be sure to include that for everyone to see. I had no idea what I was doing going into this until Shanna had pointed out that Young House Love has painted almost everything under the sun so I hopped over there for a little lesson. You can see their tutorial here and for total disclosure you will see my process pretty much mirrors what they recommend. I mean why reinvent the wheel? If they have done this and have had success you can bet I am going to follow their instructions! 1. This was going to be messy so I bought a plastic drop cloth at Lowes for $2.00 along with a couple paint brushes that I was OK with throwing away. The rest of my supplies included oil based primer (make sure it is just primer and not paint or you will have big issues)﻿, your color of choice (I used Sherwin Williams Dover White latex paint after the primer), and polycrilic for extra durability as a topcoat. 2. Once the furniture was in the basement I took everything apart including taking the seat cushions off. Even though I was recovering them it was mich easier not to have them in my way and I did not want to come close to painting them to the actual chair. 3. My table had already had some sort of polycrilic topcoat on it so I had to sand it a bit just to rough up the finish. This will make the primer stick to the surface much better. The oil based primer was really thick and felt strange to work with but I know from what I have read that it covers any marks you may have better than anythigng else out there (my table had crayon all over it). 4. First coat, oil based primer. I only needed one coat of this on everything. If you have a darker piece of furniture, you may want to consider a second coat. Oh and as a side note, this stuff has an incredibly pungent smell, I had to do this part with lots of clothes on and my bilco doors open to keep the basement well ventilated. Next time, I will wait for the warmer weather and just do this outside, lesson learned! 5. 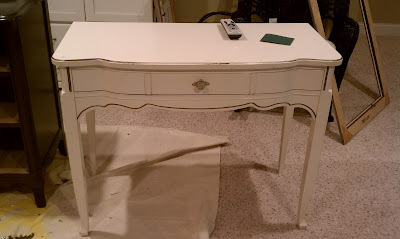 Next, two coats of Dover White. This part was really tedious but I kept reminding myself of the end product. Make sure each coat is very thin to avoid any drips. With work and life this part took me a few weeks to complete. All of the paint seemed to dry very quickly though so if you have an entire weekend to devote to this you could probably get this project done. 6. This is where the distressing comes in. I was really nervous to take sandpaper to all of my hard work for fear that a few swipes would ruin all the work I had put into this project. I was very wrong. This was so easy! I took a sandpaper block and ran it across the edges that stick out and some of the round spindle parts of the tables and chairs. It took the paint off very quickly and did not create any peeling on the paint that was stripped away. Score! 7. I have seen some people add stain to the sections they sanded to make the distressing darker, I like it both ways but I did not do this to my set. 8. Last part, two coats of polycrilic. This was just like putting on a clear topcoat of nailpolish, the consistency was very thin and went on so easy. I did the polycrilic in one night, it dried extremely fast and actually started to set while I was working with it. I still gave it a couple hours between coats. 9. All you have to do now is wait, I let it dry for a day or two and then brought it to the dining room to reassemble. This is where you would recover your new chairs (more on this in another tutorial) so your new set is complete. 10. The hard part is waiting about a week before really using your new peice of furniture. Waiting allows time for the paint to cure and adds to the durability. You will not regret this especially when you avoid knicks and scratches from using it too soon. Is anyone going to try this? Are you in the middle of any projects that you need help with? Let us know we would love to know what you are up to! Happy Valentine's Day! What better way to celebrate than with a day of organizing love? 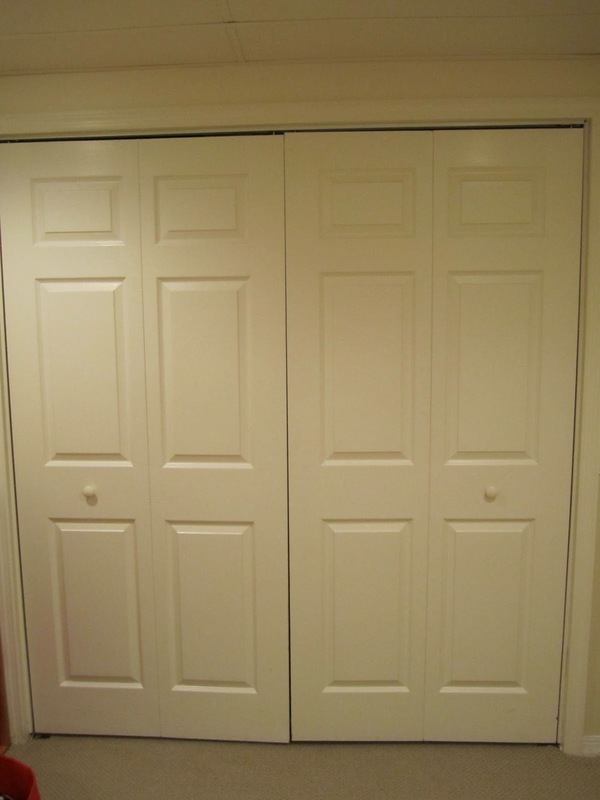 I have successfully conquered two closets in my home! The month is half-way over and that means I have two more closets to go. The one today was the biggie: our basement storage closet. Here it is ... and as you can see, it is huge! And before I share the next picture, I feel the need to give the Internet an explanation. You see, as I have been organizing the other closets and especially after I did the craft room project, this big closet in my basement has become a glorified dumping ground for things I didn't feel like dealing with until "later." Well, later came and here, my friends, is my basement closet before. Sweet merciful crumbs! I know. Just look at all the stuff! 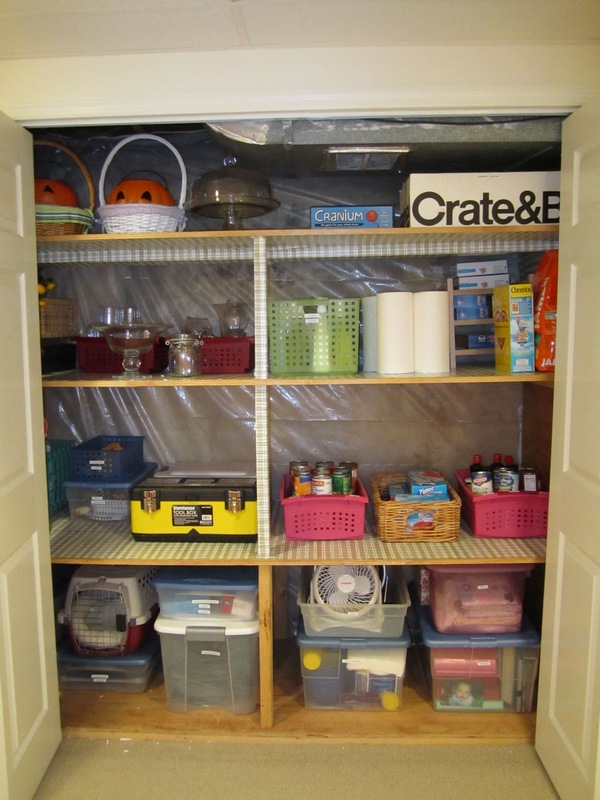 Humidifier, baskets, pantry items, paper towels, beach bag ... I had a lot of work to do. I decided to divvy it up into sections. I'll give the after picture right up front to show you how I turned it all around. Ahhhh. Much better, no? Here's the shelf-by-shelf breakdown. 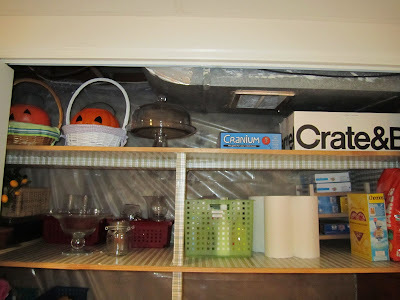 The top shelf holds our holiday stuff: kids' Easter baskets and Halloween candy holders. The little white basket held a few antique tea cups (which I love). 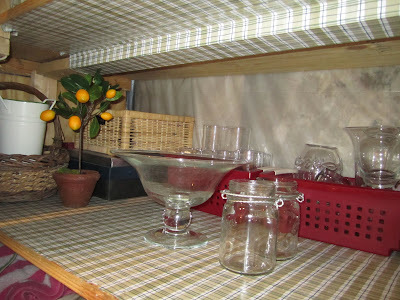 The second shelf had my tool box, drill and humidifier on the left and paper towels, the cute orange tree I got for a song at the Pottery Barn Outlet, my bin of cleaners and some random groceries on the right. Messy, Messy, Messy! The top shelf is pretty much the same: I kept the holiday stuff on the left. I emptied the little white basket and put the extra tea cups back with the lot in the Crate & Barrel box. Top shelf: done. The second shelf was also pretty simple. On the left, I just took everything out and decided this would be my "decor area." My vases, empty baskets and the orange tree would live here. Here's a good picture of that side. 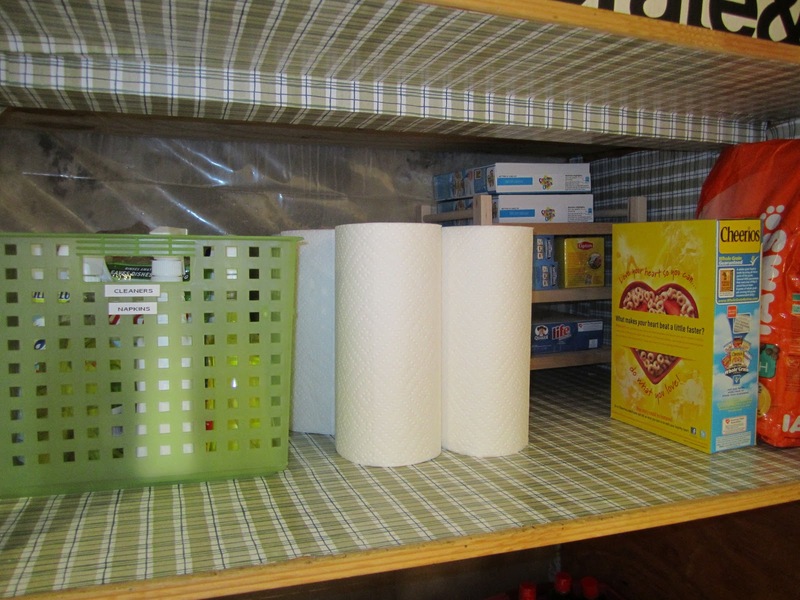 The right side of the second shelf was also pretty simple. I liked keeping the cleaners and paper towels on this shelf. I just reorganized some of the groceries and decided to put the extra cereal boxes, hot cocoa and the cat's food here too. I took the plastic off of the paper towels to make it more neat. Here's a close-up. This is bad. On the left I had random stuff: the beach bag, oscillating fans, a basket. 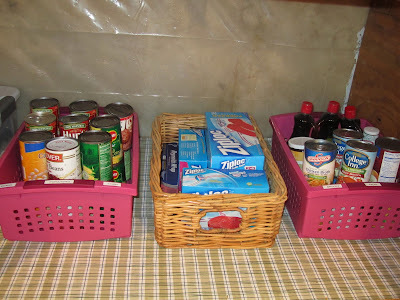 The right wasn't much better: baskets & bins haphazardly tossed about, canned goods, cereal boxes, and of course my label maker front and center. The bottom wasn't that bad. I just needed to make better use of the space. Woo hoooooo! Look at them! So much better. Top left became my tool area. 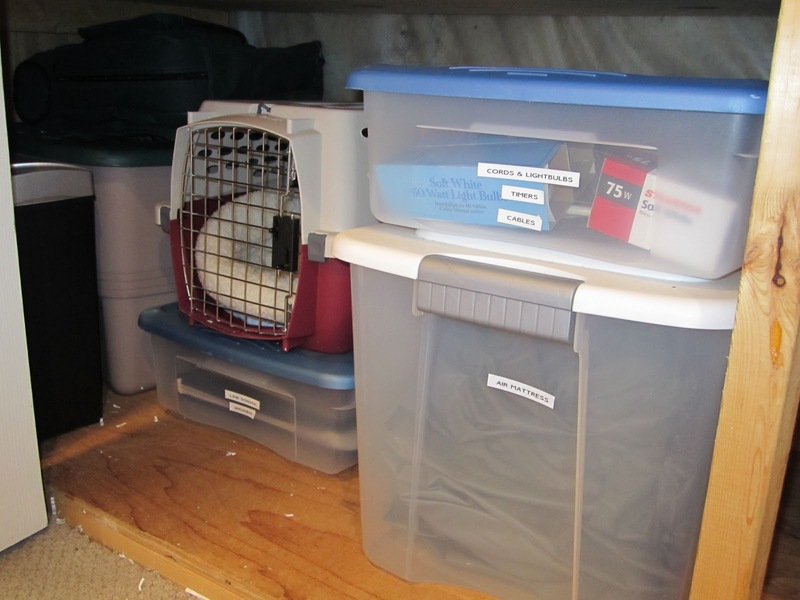 I went through all the random bins and baskets and put all my hardware and hooks in one plastic bin (and labeled that sucker). 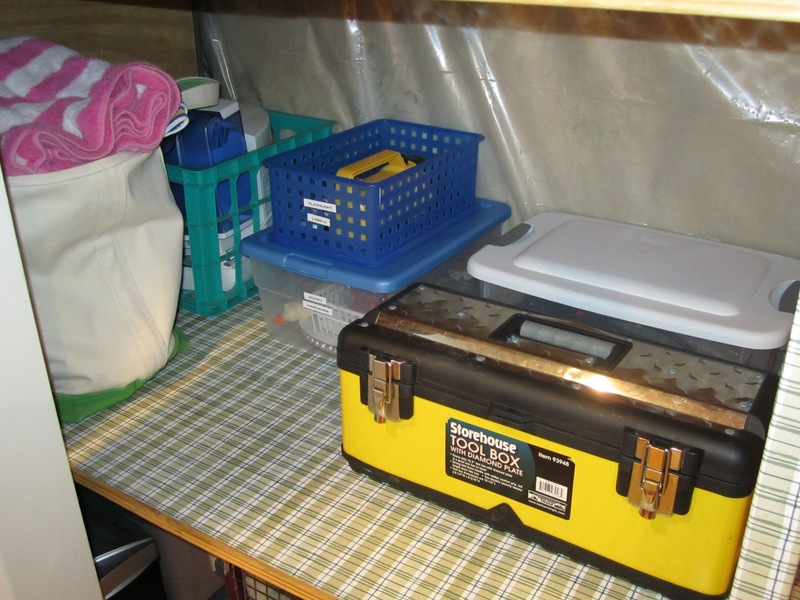 My drill and tool box are front and center because I use them often. I threw the humidifier in a crate and stuck it in the back (that humidifier is mine and only gets use when I am really sick). And the beach bag is in the corner for now. 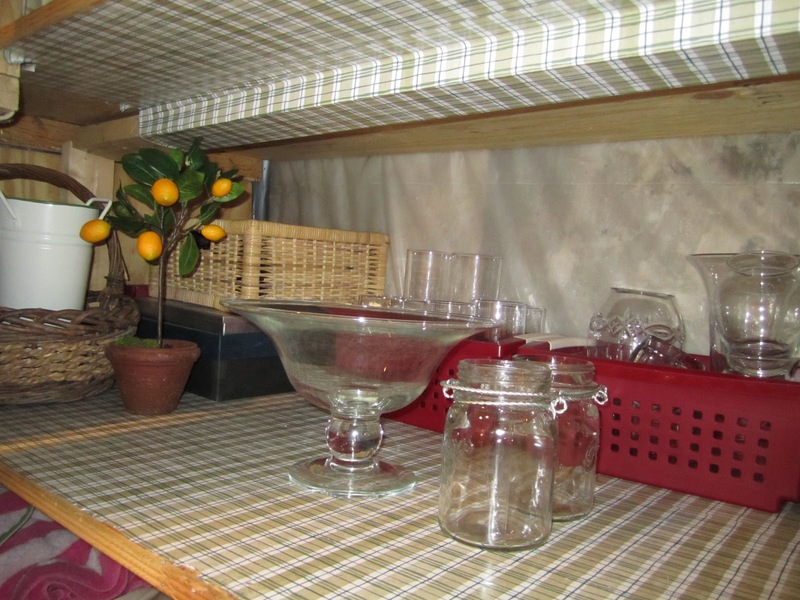 On the right is my new pantry area. 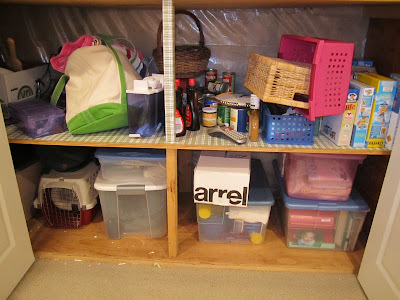 My kitchen is too small to hold all the pantry items that I have on hand, so I use this part of the closet to hold it. 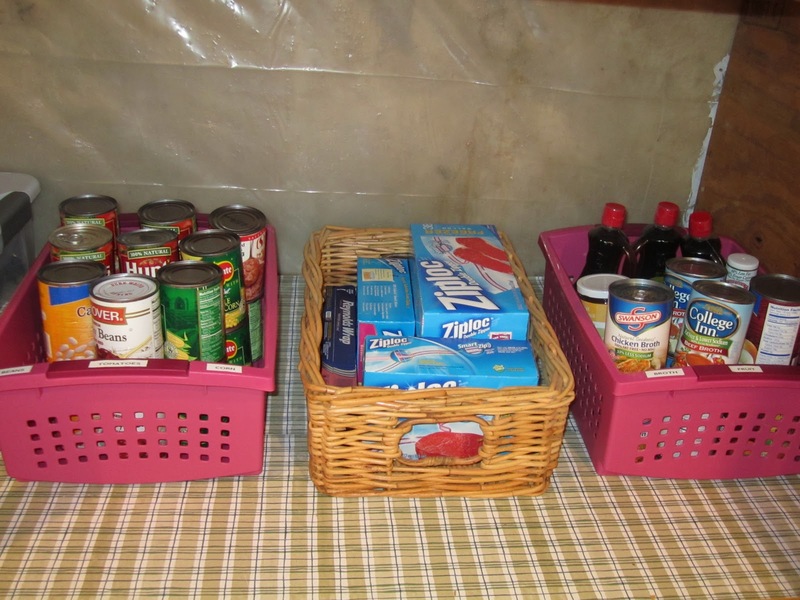 I just took three bins that I already had on hand and organized the canned goods: tomatoes, beans and corn on the pink bin to the left; plastic bags & foil in the basket in the middle; fruit, broth and miscellaneous pantry items on the right. Love! The bottom shelf was pretty easy. I just brought in a plastic bin that I had and was empty and put the oscillating fans in it and tidied up the shelves. I label everything. Even though the bins are clear, I find labels extremely helpful. And of course, a wee bit over the top. I feel about 10 pounds lighter after having finished this project. I have been sneaking down to the basement here and there to just open my closet and marvel at how it looks. 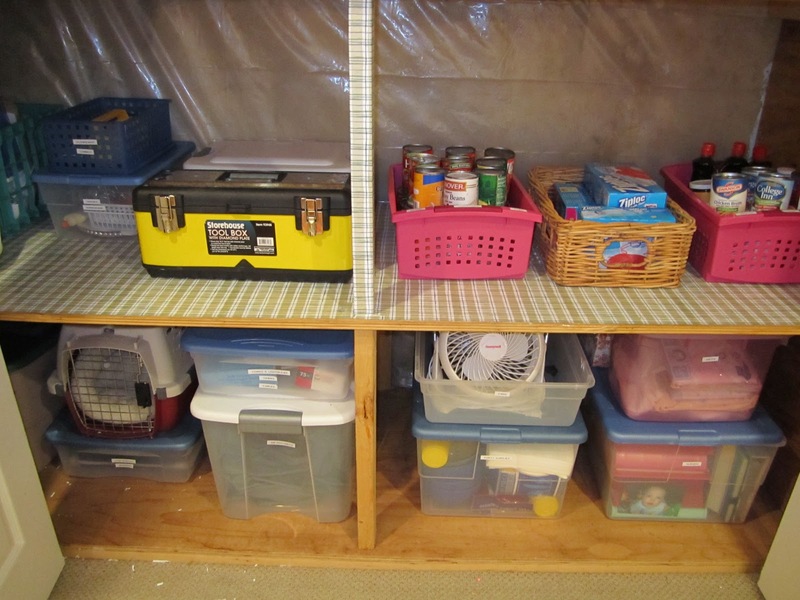 My favorite part is that it cost nothing to organize! My second favorite part, I donated only a small box of stuff to Purple Heart, which meant the things in there were actually important to keep. So that is three closets down and one to go. The only problem: I have hit the limit on closets in my house! 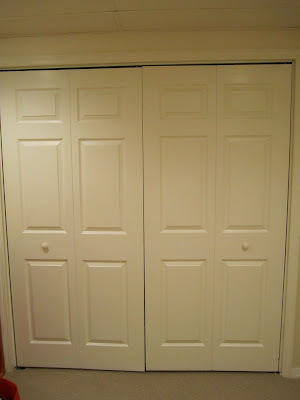 All the other closets are in terrific shape. 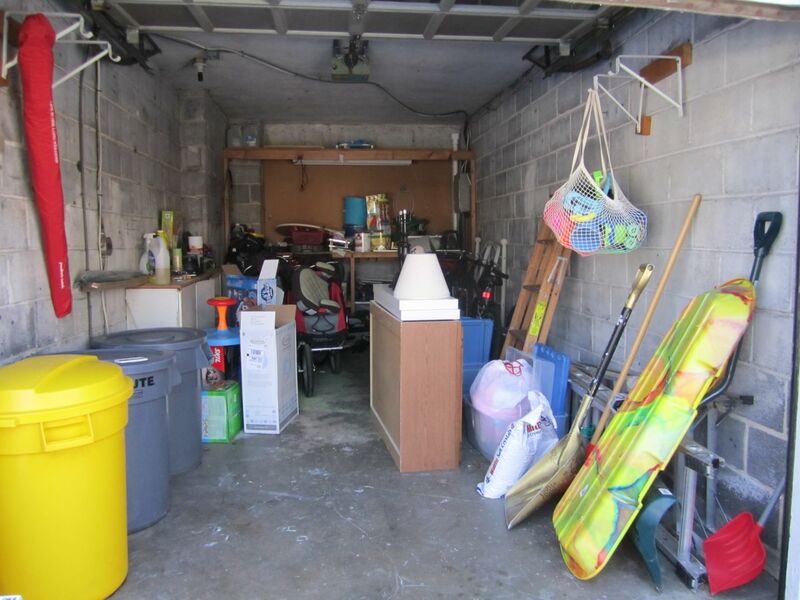 I think I'll do a quick organization of the garage ... which I guess is technically just one huge closet. Stay tuned.